At the beginning of creating the world, God decreed ‘Let the waters under the heaven be gathered together into one place.’ Whatever God brought to pass, is so humans will fear God (Ecclesiastes 3:14). Compare this to a country that rebelled against its king. The king sent a strong army and encircled them, so the inhabitants might see it and fear him. Why did God gather the waters of the sea together as a heap (Psalm 33:7)? In order that all the inhabitants of the world may stand in awe of God (Psalm 33:8). Question: Why do you think the midrash describes the creation of the waters in terms of fear? Is there anything scary about the oceans to you? How do you channel fear into productive behavior? With global warming, sea levels are rising. Historically, the main reasons they have been rising is that warming waters expand as they warm. The second reason they are rising is the melting of glaciers and ice sheets like those on Greenland and Antarctica. 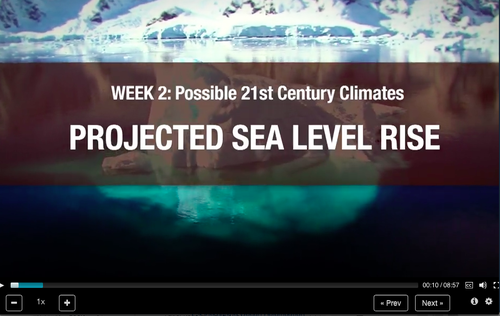 Over the last few years, the contribution to sea level rise from the ice sheets has grown. 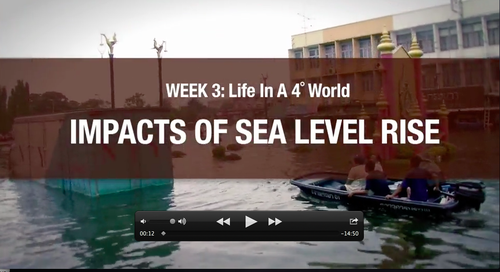 According to the recent IPCC report, sea level rise by 2100 could be approximately 3 feet. However, 2/3 of the climate scientists who contributed to that report felt the estimate of 3 feet was too conservative. Some scientists warn that if the Greenland ice sheet melts, it will contribute approximately 21 feet (7 meters) to sea levels, and if Antarctica melts, it will contribute about 57 meters or 170 feet. Action: Watch the film “Chasing Ice” with friends and family. Schedule a meeting with your U.S. Representative or Senator, and discuss your fears of 3 feet, 21 feet and 170 feet sea level rises.